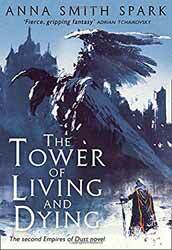 The Tower of Living and Dying (2018. 514 pages) is the second novel in the ‘Empires of Dust’ series of books, written by Anna Smith Spark. I really enjoyed the first novel, and for the most part I liked this one as well, however this time it is with some reservations. The story is pretty much split into two halves that do not meet, though I suspect that the end of the series will see the final confrontation between Marith and Orhan. Marith has returned to the White Isles to claim the throne. At the start of his story he has already killed his father, the King, and is set to march on his brother and step mother. Intertwined with his story is that of Landra, a noble woman who has survived the battle and the destruction of her home. Her only thoughts are of revenge against Marith, although if you have read the first book you realise that she is not the innocent she proclaims herself to be and in many ways she is the architect of her own destruction. Also with Marith, Thalia, the once high priestess of Sorlost, remains conflicted in her feelings for Marith. On the one hand he seems to love her and she is the only thing stopping him from turning into a mass murderer... Well, more of a mass murder than he already is. The scenes between the two are well written and Spark uses the potential conflict between the two to good effect. Believing himself, for some very good reasons, to be the reincarnation of a great and bloody warrior, Spark charts his swath of destruction with some visceral scenes of violent carnage. The book really shines when she is writing about Orhan. His inner and outer conflicts are minutely detailed creating a three dimensional empathetic character. What is great about her work on Orhan does not always work in other parts of the book, especially the beginning chapters. At one point Orhan believes that someone close to him is dead and Spark deftly intersperses paragraphs of him going about the city with the phrase "Dead, Dead, Dead!" This small choice really brings to the fore the character's conflict and pain and works well. What didn’t work so well was using this literary trick in the first couple of chapters, where it came across as irritating repetition. Overall, this very dark tale is a worthy successor to The Court of Broken Knives and in some instances improved on the first novel. The whole thing was let down a bit by the use of repetition where it added little to nothing to the chapter. Still, I look forward to the next book as Spark has created a very interesting world which has hardly been explored.